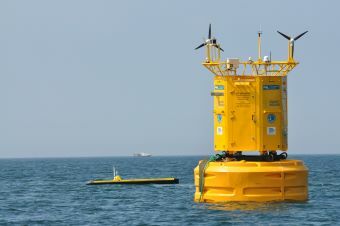 As part of the NERC Oceans 2025 programme in 2007, PML were awarded a capital grant to build autonomous buoys for the long-term stations at L4 and E1. The L4 buoy is equipped with an array of sensors to look at both atmospheric and marine parameters. These include sea surface temperature, salinity, oxygen, turbidity, fluorescence (WetLabs WQM); air temperature, humidity, windspeed and direction and atmospheric pressure (AirMar); CDOM fluorescence (WetLabs); nitrate (Satlantic ISUS) and a hyperspectral radiometer (Satlantic). All these are controlled using a Satlantic StorX logger. An onboard Linux PC104 system controls dataflow and transmission to shore using a radiomodem link back to Rame Head. The current data rate is once per hour and data is transmitted every three hours to save on power. The buoys automatically report their position using AIS. The latest in-field data, which is strongly limited by data transmission volumes, are shown in the table below. The L4 buoy is available to use as a platform for technological development. Recent collaborations have been with Witt Energy and Peak Design Ltd (Delta-T instruments). Data from the SPN1 Sunshine Pyranometer, which measures Global (Total) and Diffuse solar radiation from 400-2700 nm, can be seen below. The instrument is being evaluated for its suitability for use at sea.